As my grandchildren start get older and living far away I started feeling like there was a generation gap between us. Our granddaughters have not stayed with us for a long time. They have grown up so much and now have many other interests. The eldest granddaughter, Ivie likes being on her Iphone texting her friends, and listening to her music. Bailey was busy on her Ipad, creating pictures, playing games and sending instant messages to her friends. How was I going to get their attention? But when I look back at when I was 15 yrs. old I surely was in my own world wanting to be with my friends. I remember beginning to create my own interest and ideas of the world. Friends were the most important thing at that age for me. I decided to try and remember what it was like to be a teenager with younger siblings. I was the eldest with 3 siblings. I just wanted to have my own time, but I did enjoy taking my siblings places. I always enjoyed children. I drove to Arizona and picked up Ivie and Bailey and drove back to California the next day. They were so excited to come and stay with my husband and I especially because we live near the beach. I know they love doing things with us and they are always willing to go places with us. 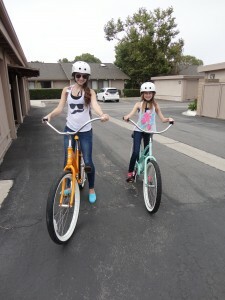 The eldest granddaughter, Ivie had saved her money up to buy a real beach cruiser bicycle. Bailey had grown out of her bicycle, so my husband Alan bought Bailey a new bike. He told me he enjoys buying items for his granddaughters, especially something we can enjoy every day. The kids were so excited to go riding on their new bikes. We rode our bikes along a beach path and it’s so much fun. We packed our lunch and rode our bikes along the beach. We rode over 10 miles. We stopped and ate our lunch on a beach bluff looking down at the water. We saw pelicans diving into the water and catching fish. We saw surfers surfing. Dogs running along the beach. 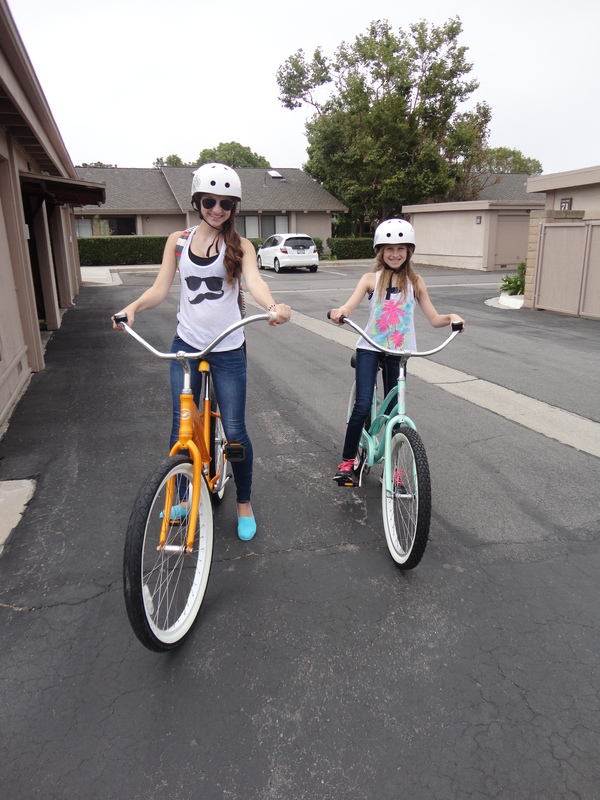 My granddaughters loved every minute on the bikes. It’s funny I did not feel like we had a generation gap any more. We all enjoyed having fun together on our bikes. That’s the secret.. choose something you all enjoy together! This entry was posted in children, families, family and tagged beach, bike riding, children, grandchildren, preteen, teenager on August 4, 2012 by Debbie Nichols.